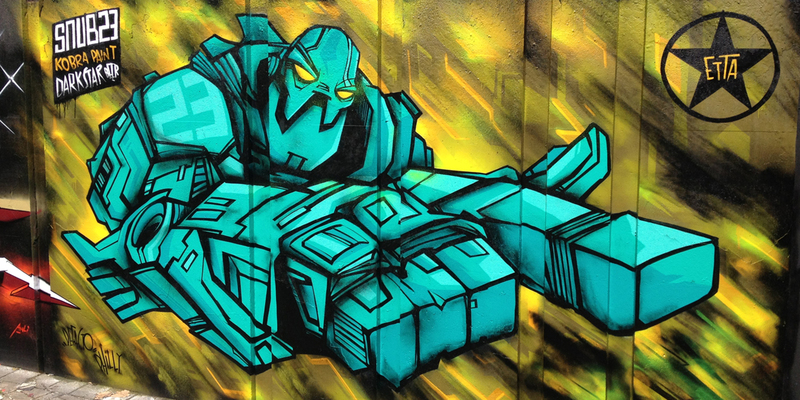 Since starting out in the 1990s, legendary street artist SNUB has become known for his futuristic murals, inspired by fictional robot Hammerstein. Towering images of Hammerstein and fellow non-violent robotic protectors have sprung up in public spaces from Shenzhen in China to Eindhoven in Holland, symbolising the artist’s guarded approach toward his life and work. SNUB is described as a graphic revolution fighting the uninvited visual invasion of commercialism. Inspiration is fired by frustration; emotion becomes a plan of attack. Anger is the weapon, and any object the ammo in the fight against the optical overload. His name is Mongrel. He’s inspired by a comic I read as a child called 2000AD. He can’t talk and he doesn’t use guns or weapons, all he does is smash stuff – which appealed to me as a child. He had a girlfriend who was human, but he could never hold her in case he hurt her. I use the robot to depict that torture, pushing the idea that there’s a human inside, and the robot is the mask we all wear. Following the tragic loss of his father, SNUB’s outlook on his art has evolved. 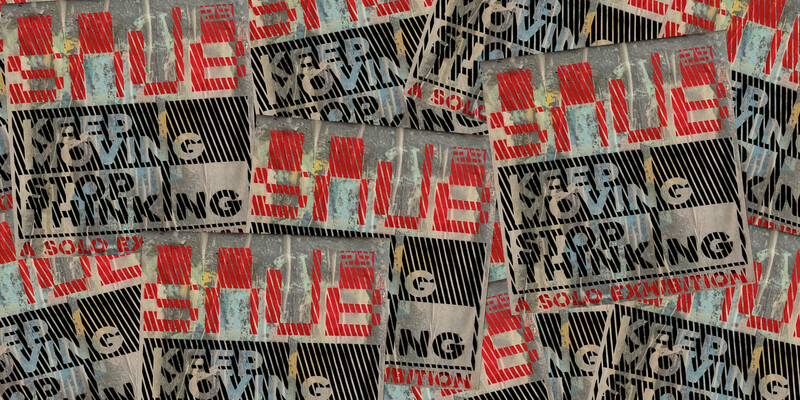 ‘Keep Moving, Stop Thinking’ is the artist’s emotional response, the manifestation of an urgent stream of consciousness, tearing away at the paradigm of conventional graffiti to create something unique, unguarded and iconic. This six-week responsive art show will be influenced in real time by interactions with the public. 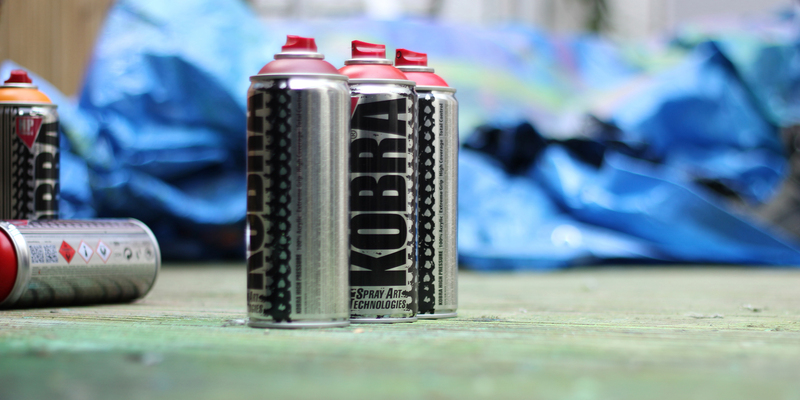 SNUB will be present throughout, painting works directly inspired by the people he meets in the moment. So what’s SNUB most excited about for the exhibition? Watching people look at the work – they don’t have to say anything, you can just tell by the way they look at it if they like it. I’ll be selecting pieces using a mixture of the ones I like and would feel comfortable painting, and using my stats on social media to see which is popular with the public. During SNUB’s residency, The Bozboz Gallery will become an inclusive, evolving haven, free from conjecture and scrutiny. All work will be available to buy along with merchandise throughout the duration of the show. Register now for tickets to the exclusive opening night on Friday the 1st of December. Sponsored by Dark Star beer, the event will also feature a limited edition exclusive Snub beer can and a live DJ set from the legendary DJ Food.